Graduation photograph of Mertie Laura Graham of Richford, Vermont, Class of 1893 at Mount Holyoke College, South Hadley, Massachusetts. 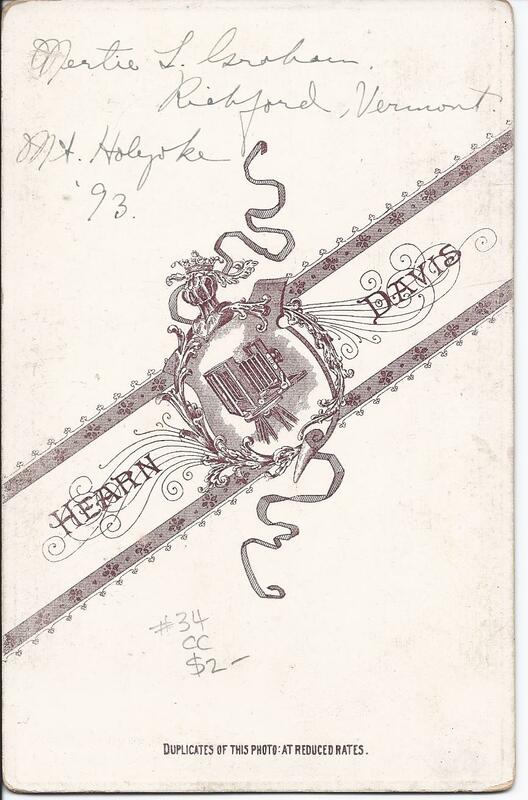 In 1896, Mertie graduation from the Hartford Theological Seminary at Hartford, Connecticut. 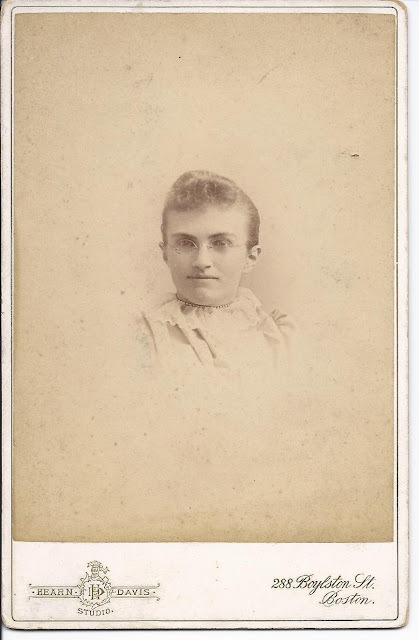 After graduation, she was involved with the American Missionary Association but is probably best known as the wife of Edwin Osgood Grover, philanthropist and first "Professor of Books" at Rollins College in Florida. 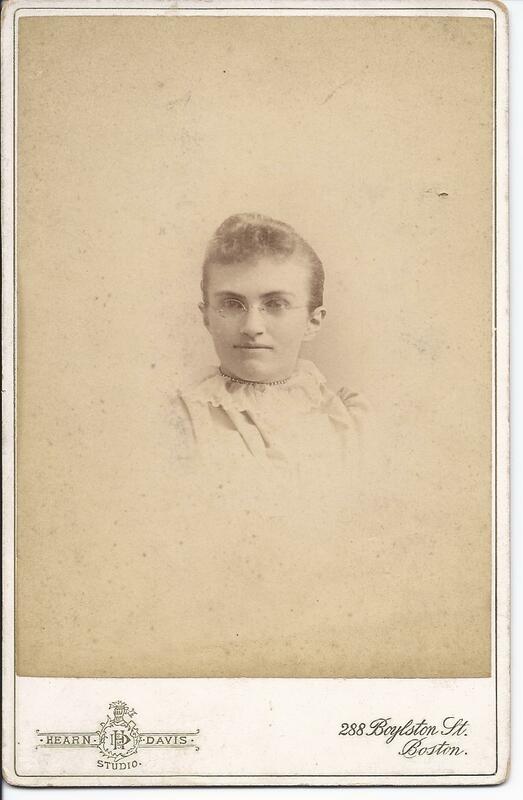 Mertie Laura Graham was born January 25, 1871 at Colebrook, New Hampshire, the daughter of William Arthur Graham and Dencie L. (Pratt) Graham, who were born in Quebec and New Hampshire, respectively. 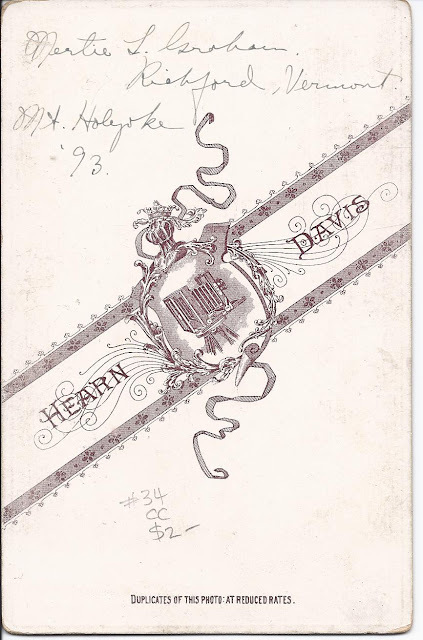 On June 4, 1899 at St. Johnsbury, Vermont, Mertie married Edwin Osgood Grover and they shortly afterward moved to 108 Bloomfield Street, Dorchester, Massachusetts. They also lived in the Midwest before eventually settling at Winter Park, Florida. Edwin was born June 4, 1870 at Mantorville, Minnesota, son of Rev. Nahum Wesley Grover and Frances Elizabeth (Osgood) Grover, who were born at Bethel, Maine, and Bangor, Maine, respectively. After Edwin's birth, the family returned to New England, where Edwin was educated at St. Johnsbury Academy in Vermont and at Dartmouth College at Hanover, New Hampshire. Edwin's sister, Eulalie Osgood Grover, was the author of the beloved children's series, The Sunbonnet Babies and the Overall Boys. Edwin led a full life, before and after his marriage. He traveled widely on a shoestring in the late 1890s. He then worked for Ginn as a textbook representative and then at Rand McNally. He started his own publishing company and later became president of the Prang Company. His life work's direction changed, however, when he accepted the call in 1926 to become a professor at Rollins College in Florida. I found an interesting biography of Edwin on a Rollins College website. The couple had two daughters and a son. They lived a life of service and philanthropy. Sadly, Mertie was killed in a car accident in 1936, and son Graham was killed in a train accident in 1940. Edwin died in 1965. They're buried in the Palm Cemetery at Winter Park, Florida. See a photograph of the setting of a stone in Dr. Grover's honor in the Rollins College Walk of Fame on the occasion of his 88th birthday in 1958 here. If you have any corrections and/or additions to the information above, please leave a comment or contact me directly. Mertie Graham was a tutor at the black Grammar School in Hannibal Square in Winter Park, and Edwin started a black library in her honor after she died. Black education was not a priority in Winter Park at the time, although Rollins College always had an "interracial council" that attempted to improve attitudes toward the Hannibal Square Community. Thank you for this insight, which demonstrates the couple's humanity and commitment to their fellow man.